If you desire to reach the global height of tea knowledge – and do so by gaining your certification at the most iconic tea growing location in the world – then this course is for you. With the backdrop of stunning Yunnan Province, our flagship Tea Sommelier Certification Course takes place in Puer, China. While attending the course, you will literally live, breathe, eat (yes, eat!) and learn tea deep in the mountains at the Puer Tea Garden Hotel. The hotel restaurant will provide organic foods infused with tea flavors for all your meals, while our class sessions together will entail actually going out into the surrounding tea fields and mountains to pick, pluck, roast, taste, and learn from the wild tea trees and local tea masters themselves. Throughout this course you will be guided step by step on your own personal journey from book to branch, lesson to leaf, and back again. Comprehensive content of traditional true Tea Ceremony and tea brewing. From varietal differences between leaves to Japanese and Chinese tea ceremony. Key attention will be paid on tasting notes, methods, culture differences and how to brew tea properly with the way of keeping good health by traditional Chinese medical health care concept. Professionally international standard Tea Evaluation. It’s a rich curriculum will be provided to teach the student to differentiate how to judge the tea quality through the whole process of tea tasting. 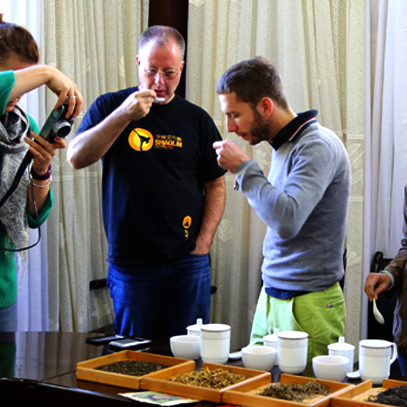 Students will also learn keywords taken straight from the professional tea industry, and will be able to speak confidently about the drink, after this learning you’ll have strong ability able to judge the tea quality easily from different types of teas from the world. In this course we will focus on the professional techniques of Tea Blending. Required for developing both traditional blends and signature formulas. And we will finish with an in-depth lecture and Q & A on the workings of the global tea business. This is the perfect part of the course for those tea professionals interested in starting their own tea business or who already own one. In this course we will go to a Puer tea plantation to learn everything about tea from the time it is planted until it gets to your cup. You will hand-pick and process your own teas to see from start to finish how tea is truly made. You’ll have very rare opportunity to hands on experience of how to processing tea! This is a very important part of the course for those tea professionals interested in starting their own tea business or who already own one. We'll bring you to visit real tea plantation mountains and true tea artisans, every single one will have hands on experience of tea Processing and learning how tea growing. This is the supplemental online course that begins the following week after you have left Pu’er. It involves home study of the ITA’s over 10.5 hour online courses, and these courses are lifetime available and you'll have Q & A service for lifetime. You'll get over 10 different kinds of high quality teas and professional Tea Evaluation tea cup set bring to home for your home tea evolution study and examination. We'll offer you comprehensive and professional ITA Tea Sommelier Study Menu and two important tea books in the tea industry: The Wild Truth of Tea and Wild Tea Hunter for your home study to dig in more of International Tea industry. You'll get a high quality and beautiful traditional tea ceremony tea utensil set for your daily tea brewing. 3 organic meals per day included. (Breakfast, Launch, Dinner) From 11-14th Oct 2019. We require all of students arrive at Puer (Simao) airport in Yunnan province China on 10th October 2019, we'll have car come to pick you up at the airport for free. On 15th Oct 2019 we'll send you back to the Puer Simao airport in Puer city for free. Who Can Join Our Tea Sommelier Training? It is never too late or too early to start learning tea! Whether you are new to tea or an advanced practitioner, you can learn and benefit from our full course curriculum. We have personally taught everything you need to know about tea to students in their teens all the way to in their 80′s. This is open for any level of tea practitioner: beginner, advanced or professional. Choose from our specifically designed modules for proper tea healthy life development and open your decent new career. Email us at info@internationalteaacademy.com for your queries. ＊Early Bird Discount: Pay in full and get $200 off. Take action before this offer expires Nov 30th 2018. We strongly suggest registering in advance to ensure your spot. There are many schools who focus on theoretical knowledge while we focus on a “body of knowledge”. At ITA, we believe in making transformative tea education accessible for everyone.We bring you world-class courses from the world's top tea authors and brands to allow you to create remarkable transformations in all areas of your life. We have over thousands of online tea lovers and tea learners are following us, and we don't teach any low quality theoretical knowledge, We bring together the world’s best tea teachers, a thriving community, build a lively and fun tea practice - no matter your age, fitness level and body type. Choose from our specifically designed modules for proper tea healthy life development and open your decent new career..
Will I get ITA certified tea sommelier certification after completing this course? Are food, accommodation and airport transportation include in the fee ? Yes. Will be included delicious organic local Yunnan food, high quality tea garden hotel and airport transportation. I have already done similar types of courses in other place, should I still take this course? I do not have any experience in Tea and thus was wondering if I would still be able to accumulate enough knowledge and confidence to become a Tea Sommelier after the training? We have designed a step-by-step system of Tea learning so that if you practice dedicatedly and follow the program we have laid out then you have a very high likelihood of being able to pass the certification tests. We have had complete newbies come and pass the test through dedicated practice. How can I become a ITA Certified Tea Sommelier Instructor? In order to become a certified ITA Tea sommelier Instructor, you need to become ITA Certified Tea sommelier first, after this, you must successfully complete the ITA Certified Tea-Cher Training. All the application requirements and course details can be found on our Academy page. Check our ITA Certified Tea-Cher Programs to get more details. Will Shana Zhang be teaching this course directly? Yes, Shana Zhang will be the teacher for the majority of the classes. And some of other over 10 years experienced tea-chers would be the assistant at the same time. When will be the deadline of the date for register the training? If you would like to choose pay in full program, please register it before March 31st 2018. If you register before Jan 15th 2018, you will able to get $200 off discount for total amount. This training will be only open once we have 6+ registers. After you paid, but we couldn’t able to open the training (less than 6 registers), we’ll refund full amount of your payment. (We'll send you notice 3 months before the training start). If after you paid, and we'll able to open the training (more than 6 registers), but you would like to cancel the training, don't worry, please give us note one month before the training start, we can transfer your credit to a future training. Is this training suitable for beginners?